JERUSALEM (CNN) -- Israel's next government is shaping up to be a narrow conservative coalition after designated Prime Minister Benjamin Netanyahu failed to strike a deal on Friday with the moderate Kadima Party. 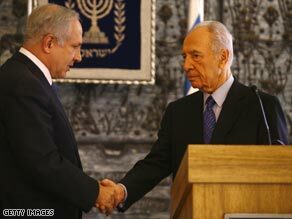 Netanyahu (left) shakes hands with Shimon Peres, who has asked him to form the next government. "Unfortunately, I encountered a complete refusal for unity, a complete refusal to create joint teams to reach arrangements in order to find a common ground," Netanyahu told reporters after meeting with Kadima leader, Foreign Minister Tzipi Livni. "I found no willingness for unity by Livni." Israel's other major moderate party, Labor, has already stated its unwillingness to join a government led by Netanyahu's Likud Party. Livni said the main sticking point was Netanyahu's refusal to adequately commit to negotiations with the Palestinians that would lead to a Palestinian state. "A two-state solution is not an empty slogan," Livni said. "It is the only way in which Israel can maintain its existence as a Jewish and democratic state." She said the meeting ended "without agreements on issues which I find essential in any entrance to the government." But she left the door open just slightly, by saying that "a true unity is possible." "There can be a government that will promote these issues," Livni said. "At the moment based on the conversation I just had in the next room, it is not going to be Netanyahu's government." She did not say whether or not she would meet with Netanyahu in the future. Kadima -- the party of outgoing Prime Minister Ehud Olmert -- won the most seats in the Knesset, Israel's parliament, in this month's elections. But Kadima received only one more seat than Likud. With the surge of other right-wing parties, Netanyahu already has enough seats to form a government. But he needed the cooperation of Labor or Kadima to fulfill his promise "to form a broad national unity government." Netanyahu told reporters on Friday that he offered Livni several deals to get her to join the government, including complete partnership in writing the fundamentals of the government, equality in the number of positions in the government, and two of the three main positions in the government. He also said he offered a willingness to change the Israeli election system and find a solution to the issue of civil partnership. Israeli President Shimon Peres tasked Netanyahu with forming a government last Friday. He has six weeks to do that or the process will start all over.